M+B is pleased to announce Neverland Lost, the premier exhibition of color photographs by Henry Leutwyler. 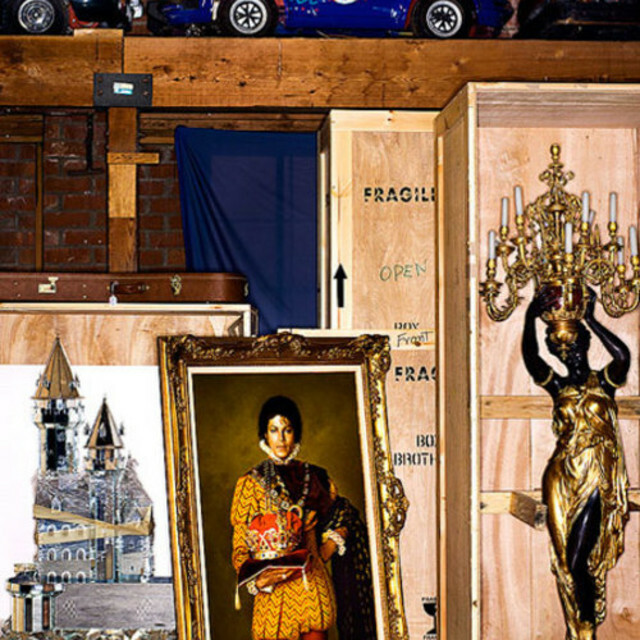 In stark objectivity, Neverland Lost examines the Michael Jackson myth through portraits of personal items and pieces of his stage costumes—like the iconic sparkling glove—that were removed from Jackson's Neverland Ranch and intended for auction. There will be an opening reception for the artist on Thursday, June 10 from 6 to 8pm and a book signing for Leutwyler's newly released monograph by Steidl titled Neverland Lost on Saturday, June 12 from 2 to 4pm. The exhibition will run from June 10, 2010 to August 14, 2010. Through the cool, documentary scrutiny of Leutwyler's lens, the taxonomic portraits give a glimpse into the inner turmoil of a man caught between the public persona of one of the greatest entertainers of all time and his troubled and sequestered private life. The famous sparkling socks that peeked out from glittery shoes turn out to be ordinary white tube socks decorated with rhinestones. Sequined shirts decked out with sashes and epaulets bear traces of makeup and sweat. Perhaps for the first time, we see their mundanity. But as demystifying and unsentimental as these portraits may be, in Neverland Lost Leutwyler creates a catalogue of images that are almost too intimate to behold.